The thing that makes this photo a winner for me is my facial expression. Joy is a hard thing to hide. Is it possible to love something too much? What if that something is creeping undeath? 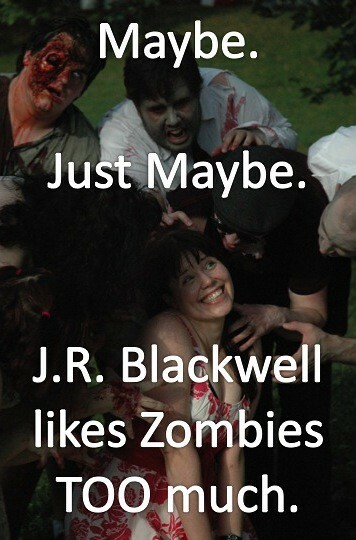 Sure, some people might say that I like Zombies too much, but I think they’re wrong. So what if I get my brains eaten? No one can say that I didn’t have fun along the way. This is part of the Shelter In Place promotional shoot taken last weekend. There are so many great photos from this shoot and I can’t wait to share them with you!